I would definitely recommend starting to learn Swedish with Anneli. Anneli is a very dedicated and experienced teacher, and she is very professional. She has been providing the right amount of exercises, information and grammatical notions while being attentive to my progress and learning curve. She also always takes the chance to correct you in a gentle way, and give you memorizing or practical tips on how to improve pronunciation and comprehension of the language. My Swedish has definitely improved and I am now able to have a basic conversation, I know that if I’ll keep studying with her I can take my Swedish to the next level. I could not have found a better and more professional teacher! Jag började att plugga med Daniel sen slutet av 2016. Vi är nära att komma färdig med 140 timmar av svenska. Jag kunde säga många saker men bottom line är att jag har bokat nästan 150 timmar efterson jag känner mig att jag kan ha en lag nivå samtal i svenska nu. Min svenska är inte perfekt men mina kollegor i Sverige och min frus mamma är imponerad med min progress. Swedish lessons with Daniel have propelled me at a pace much faster than I had expected. I had been taking lessons in person with a local teacher, but it wasn’t until I switched to sessions with Daniel that I began feeling competent and seeing progress. He is such an excellent balance of challenging and patient, and always encouraging. For someone like me starting from the beginning, he is the best choice. Our lessons are a mix of homework review, textbook lessons, reading articles in Swedish and going through worksheets he’s made himself. He guides me through the content, but also listens to the areas I want to focus on and factors them in to the curriculum. After 30+ hours of lessons, I couldn’t be happier to have him as a teacher! After one year break of learning Swedish with Swedish Made Easy I am again back and enjoying learning this language as the very first time! Since I started again, I have been working with Daniel for more than 9 months now. And I think my Swedish has improved quite a lot. Daniel makes me feel really confortable when I talk to him and now I am not afraid when I tried to talk to other swedes. He also motivates me quite a lot which has increased my interest to read in Swedish. Now I even read “real” books in Swedish!! And not only the ones for kids…He is a really good teacher because he always solves all my questions and prepares the lesson when I want to focus on something in particular. But what I like the most is that learning with him is just fun! Because we talk and laugh about everything without realising that I am in fact studying!!! And this is really good!!! I like learning with Anneli and Daniel, because every lesson is not just learning words and grammar. I see it as sharing different experiences but using a common language. Cool, isn’t it? I keep having a great time in my lessons with Daniel. After 50+ hours of practice I feel I can sustain a conversation with my wife and in-laws. I will keep at it and hopefully by 2018 I will be able to work in Sweden. Thanks Daniel. I’m halfway through my second batch of 10 Swedish lessons with Daniel. I had been learning on my own mostly and progress was coming with quite a lot of frustration. It has been good to speak to Daniel while reviewing the contents of Rivstart, start using new words and reinforce them, and reading news online to learn everyday words. Daniel is easy to talk to, very perceptive to set the complexity / speed of language bar to keep challenging his students, and makes learning feel less of a chore.I plan to continue doing 2 lessons a week and the set up with Swedishmadeeasy allows me to fit it around my work which includes a lot of travel and sometimes interrupting work phone calls. I’m hoping that I can become fluent within the next year or two to be able to move to Sweden with my future wife. *Daniel is a great teacher, if he wasn’t I wouldn’t have him as my teacher for two hours a day, Monday – Friday. Within the first minutes I felt comfortable speaking to him in my jumbled and often non-coherent Swedish. I couldn’t recommend him enough. I started learning Swedish 3 months before I got to Stockholm to start my Master’s. And boy am I glad that I started right away with Anneli! The goal for me was simple (if not easy) – to learn enough Swedish in 2 years that it is not an issue when applying for jobs. Fast forward 1.5 years, standing somewhere between B2 and C1, I could not be happier with our progress. After arriving in Stockholm, while my non-Swedish friends were busy dabbling with Duolingo and considering going to SFI classes, I was already on way to finishing up B1. All that elitist talk, just to get across the point that taking classes with Anneli will give you an insurmountable edge. By the way, all of them gave up on learning Swedish..
Swedes’ good English is a hidden curse because you can get by without learning Swedish. In fact, it took a while before they stopped switching to English with me. That’s why I found it all the more valuable when Anneli started conversing almost exclusively in Swedish with me after our first 3 months. I needed all that practice (and still do..). Her patience and genuine curiosity meant that I was not afraid of making mistakes in Swedish – something I wish I could say for the other languages that I am learning. This also makes the classes with her a lot of fun! I still look forward to every single one of my classes with her. Finally – and this one’s a doozy – it is the most efficient way of learning Swedish. As a master’s student, I can’t afford to spend my time commuting to a 3 hour-long evening course with perhaps 15 min of personal attention from a teacher. I’d always believed that I was useless at learning languages. I have Swedish ancestry and was fascinated with Scandinavian culture, but when I tried to learn Swedish from a book, aged 20, I just couldn’t seem to get anywhere, compounding that belief. Fast forward 20 years, and Duolingo released the Swedish course on their language learning app. I decided to give it a go, and realised very quickly that, in fact, I could learn a new language, especially if that process was enjoyable – and it was! I’d watched a few of Anneli’s language videos on YouTube and thought it might be a good idea to have a few ‘proper lessons’ with a language tutor. Since that day I’ve had regular lessons with Anneli, typically one lesson every two weeks. Duolingo is good, but having a real teacher is even better! Anneli’s lessons are relaxed, fun, and cover a wide range of topics and skills – and they’re absolutely tailored to meet your specific needs. Typical lessons (for me) consist of developing conversation skills, working from text and exercise books, learning about Swedish and Scandinavian culture, translating passages of text, reading out loud, and exploring the origins of Swedish words. Anneli has helped me select Swedish books to read at my level, and she’s also recommended some great Swedish films to watch. Anneli regularly sets homework for me – my favourite (and most challenging) was to watch a 10 episode Swedish drama in Swedish using Swedish subtitles! I managed to watch the whole series and understand everything. Unbelievable! Two years on from my first lesson, I have a couple of Swedish friends who I message with in Swedish, and can meet up for “fika” with them and chat in their language. I love watching Swedish drama (with or without the English subtitles), I read Swedish books, and enjoy exploring Swedish culture. Swedish is a wonderful language – very similar, at times, to English. I haven’t been to Sweden yet, but I love learning the language. If nothing else, it’s a wonderful hobby! I’ve got so much more to learn – that’s not a daunting prospect – I can’t wait to get stuck in! Anneli is a supportive and encouraging teacher, and I strongly recommend her as a language tutor. Booking lessons is simple via her website, and they’re easy to manage online if you need to change dates or times. I still use Duolingo regularly (and a few other useful language apps), but having a proper native-speaking Swedish teacher makes it real – and much more enjoyable! I now love languages, and I’m beginning to learn Russian too, and when I’ve got a bit better at Swedish I’m thinking of learning Icelandic. Swedish language will now always be a part of my life – a huge thank you to Anneli for opening up my world to foreign language, and making the learning process so enjoyable! When I first got together with my Swedish boyfriend (now husband), I quickly realised that I would need to learn Swedish if I wanted to build relationships with his family and friends. I looked into Swedish courses, but I work long hours and I was nervous about paying a lot of money for a course that I might not find useful, and that I might not be able to attend every lesson of. I found Anneli through googling and I’m so glad I did. The Skype format is a dream – so much so that I don’t know why we bother learning languages any other way anymore! It means I can book lessons at the time that suits me, change it week-on-week, or take weeks off if I need to. The lessons are personalised to me so I can go at the right pace and can explore particular topics that I’m more interested in. Anneli also types out new words or sends me links as we talk, which is really useful to clarify spellings or meanings. Also, Anneli is a truly outstanding teacher. She adapts her teaching to match your pace while stretching you at the same time. She’s very patient and encouraging, and explains things so that they’re crystal clear. She’s incredibly professional and focused, but is also warm and interesting to chat with (which is important when you practise conversation skills every week!). I’ve been learning for over three years now and I’ve seen steady progress. I feel far more confident now having conversations and interacting with people. It’s a great sense of achievement and Anneli has been instrumental in getting me to this point. When I had relocated to Sweden it became clear to me that to really try and integrate in to a country knowing the language is a must! In a supermarket, out in a bar, at work, sat on the tram ……. wherever you go people will inevitably talk with you and so I knew I needed a way forward. Having tried SFI after 2 or 3 months in the country I felt the large class size and fixed weekly time slot did not suit me …. I needed something else. Following a little bit of research online I came across Anneli and Swedishmadeasy. Anneli offered me a flexible way of learning Swedish that I could fit around my schedule in the comfort of my home. It also meant 1 to 1 dedicated lesson time following a recognised language framework. What more could you ask for ?? Well you also get an extremely knowledgeable, friendly and fun Swedish tutor who is just as happy having a good conversation about the week just gone as she is navigating you through the course material. The attention to detail is always there and Anneli often points out regional differences in my location, Göteborg. Anneli is always very accommodating and has helped me moving lessons around to maintain my studies on numerous occasions. Although I am still at the start of a learning curve I know I made the right decision learning Swedish with Anneli I would highly recommend Anneli as a Swedish teacher, you won’t be disappointed! After three years in Sweden, I could barely put three words together. A silly bet I made with my Swedish colleagues forced me to confront reality: my English-speaking job had become an excuse for not learning the local language. The truth is that I had failed before and given up to avoid further disappointment. My problem was that I had never begun to learn a language outside of my school years. I didn’t know where to start, so I tried to replicate the academic process. I enrolled to expensive evening classes, thinking that by magic I would walk out with fluent Swedish skills. While I’m sure such classes work for some people, they turned out to be a waste of time for me – simply too much reading and not enough speaking. I decided I needed a completely new approach, focused on dialogue. So I looked for a dedicated teacher and found Swedish Made Easy. The first steps can feel very uncomfortable, as you sound like Tarzan most of the time. But Skype provided a safe environment for practice and Anneli made me feel at ease straight away. She was always attentive and adapted perfectly to my needs. When my level increased, so did my frustration (frustration is a sign of progress! ): it’s fair to say that when it comes to patience, Anneli is in a league of her own. In the end, our lessons ended up being conversations about random subjects and learning Swedish felt like a truly enjoyable experience. I can now speak confidently at work, which helps me connect better with colleagues and understand the local culture in a deeper way. If I had to do it again, I would do the same thing – except I wouldn’t wait three years to get started. I have been having lessons with Anneli now for 6 months. Looking back on those 6 months I can’t believe how much I have learnt! Before I had these lessons I had picked up a few phrases, but I had no actual idea about grammar, structure or something with the language. I found it frustrating that I was only learning Swedish in a ‘parrot fashion’ and so very very limited in what I could say and understand. In 6 months I have learnt so much! I do not feel limited by my lack of language, but rather I feel liberated in my Swedish! Anneli has given me the building blocks of Swedish so I can talk about what I want to talk about, add to conversations and be able to do every day things in Swedish. Often language programs just try to teach you how to say things in ‘parrot fashion’ how to order food, how to describe yourself, how to talk about the weather – but Anneli gives you the structure behind it (why and how to say it) so you can say what you WANT to say in the future! Learning with Anneli has been the best decision I ever made. Now I can read basic Swedish books because can understand how the sentences are put together, how the grammar works rather than hopelessly using dictionaries or google translate. I can feel confident in speaking to my partner in Swedish, and her Swedish family and friends. I even dream in Swedish now – that’s how good the lessons are! Our lessons are structured into two normally – conversation and building confidence in saying what you want to say, and then the lesson including reviewing homework. Anneli has so much experience in teaching Swedish that you can feel assured when you spend your pennies you are investing in it wisely! I would highly recommend her to anyone, and I have no doubt in time I will be able to speak Swedish so I can work as a nurse in Sweden in the near future! Thank you Anneli for fab lessons! I have always been interested in swedish language, yet i have faced a very serious obstacle.. I had a fear to start speaking. Words were simply not coming together, i was afraid to talk. That was exactly the time when i started having lectures with Anneli. She was so calm, confident and encouraging that after already few lecture i started breaking through “the wall”. Great feeling! She was able to easily adjust her language to the level i had at that time and at the same time to give new words and expressions that were building my vocabulary. We were learning conversational style, slang, official expressions and were reading swedish literature. Working with skype is a great advantage, as one can easily access all the material through “chat” and all the words, furthermore it is really interactive. Moreover the booking system is easy and advantageous. Anneli is really friendly person so one can get easily comfortable with her. And let me say, that is a very important prerequisite for language learning. She was coming up with her own teaching methods and at the same time was listening to my own ideas about what might be cool to try. We have also practiced the “speaking” part of Swedex test, where she gave very useful hints about it. The result was B2 level. And after 2 more months C1. 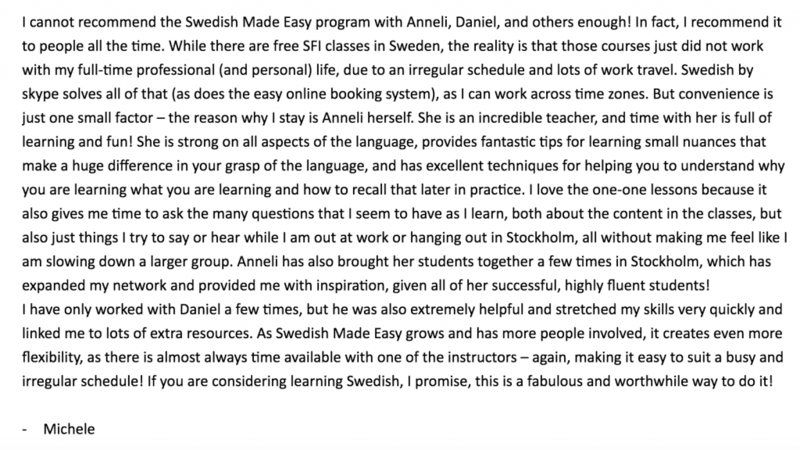 I definitely recommend Anneli for those who want to get proficient in swedish, who want to learn it with ease and fun! After quickly realising that I would not be able to attend an actual language class in Swedish, I was somewhat skeptical at the idea of learning a language with a tutor over Skype, but I came across Swedish Made Easy by chance and booked a lesson after seeing all the amazing reviews Anneli had, and I’m very glad I did. With no real previous experience of learning languages and finding myself terrified that I was going to be horribly rubbish at it from the start, not to mention my avid fear of the pronunciation of some Swedish letters/words, I found myself at ease instantly at the start of my first lesson, and Anneli made me feel completely comfortable and restored self-confidence in my learning, not to mention I didn’t feel silly or awkward at all trying to pronounce things. Anneli is incredibly patient, friendly and is versatile when it comes to helping you conquer any fears to do with learning a new language or any fears/worries about the language itself. I started my first lesson only knowing two basic Swedish words, and finished it knowing a great deal more than I would’ve imagined, but not too much to find it overwhelming. It was also really nice at the end of the lesson to be complimented on what I did well, what I picked up quickly and what Anneli thought may be my best style of learning, which she was able to pick up on quickly. Overall, I couldn’t recommend her enough! If Swedish is the language you want to learn from scratch, brush up on or further your knowledge, Swedish Made Easy is the best there is. The best Swedish teacher ever!! Since commencing Swedish lessons with Anneli last year I have improved my Swedish enormously. I feel more confident speaking to friends and family, thanks to Anneli. She makes the lessons very enjoyable and I look forward to speaking with her every week. The lessons are interactive, informative and fun yet also challenging. I highly recommend Anneli to anyone wanting to learn Swedish. In the context of understanding why swedish people vacate the streets of Stockholm on midsommar afton, it is clearly necessary to involve a professional. Someone who, in the wake of an increasing level of confusion as to what ‘Hej doa!’ if you live in southern Sweden, or the ‘jhup!’ from up North mean, can explain the reason why so many small sentences seem to break each other to probably signify something extraordinarily important. And Annelie is that person. Patient, clear and disciplined (for the undisciplined like myself), pretty as all Swedish women are, and certainly focussed on getting you to be able to order food, write a letter to the skatteverket (tax office), Anneli is a great teacher. I have really enjoyed her culture, her sense of the modern in the ways she communicates and makes the, sometimes tedious, grammatical rules come to life. I would like to recommend Anneli to anyone who has a desire to learn the basics but also to those who want to improve their Swedish. In short, rock on girl! I am so glad to have found Anneli. She is very good at speaking at a level I can understand and at assessing where I need improvement. My Swedish improved in just one lesson! Anneli is a nice teacher with great patience. I feel very comfortable having classes with her and she brings confidence in me when I try to speak Swedish. She also makes it fun, relaxing and enjoyable to learn a language with her own teaching style. I notice I have been making progress with my Swedish and at the same time, I have also learnt other things about Sweden from Anneli. Taking lessons through Skype is a lot easier and more convenient than I expected. All in all, I enjoyed our lessons and I would recommend Anneli to anybody who wants to learn Swedish. I could not recommend Anneli’s courses more. Although I was lucky to have Swedish speaking friends who offered help with the language, it wasn’t until I started classes with Anneli, that I felt I’m making a real progress. I was a bit apprehensive about learning through Skype at first, since I haven’t tried it before, but after my trial lesson, I knew I found the perfect teacher. The teaching was structured yet relaxed, intense but enjoyable. Most importantly, I could quickly see the results and my confidence in speaking Swedish rapidly improved. Anneli’s classes were always well prepared, interesting and adjusted to my needs. Apart from being a great teacher, she is fun and a real pleasure to talk to and I genuinely enjoyed my time with her. From very, very basic Swedish in a little over the year I reached the B2+ level which really made a difference once I moved to Sweden. I have thoroughly enjoyed my experience working with Anneli. I would recommend her to anyone that is planning to move to Sweden for professional or personal reasons and needs to become familiar with the language in a short period of time. I was sceptical about online learning at first but it turned out to be a perfect solution for someone with a busy and often unpredictable schedule. The online booking system was easy to use, hassle free and I could book classes with full flexibility. Anneli’s teaching is clear, well-structured and proved to be very effective providing me with a strong foundation for medical work in Sweden. I can now communicate with ease with my colleagues and patients, and feel confident using Swedish in everyday situations. This could not be achieved without Anneli’s commitment and teaching techniques. Her classes not only gave me a strong language skills but were also truly enjoyable and I would highly recommend them to anyone. Thanks to Anneli, in a year I’ve gone from a complete beginner level to a level where I can now read the daily newspaper, watch movies and handle basic conversations in stores or at work. My expat friends are envious of my steep progress 🙂 Anneli’s focus on conversation during her lessons is extremely helpful and I am always amazed how she manages to bring her Swedish to a level where the student can understand what is being said and interact. It’s really good for motivation! Taking lessons via Skype is also super convenient and the cost is very reasonable compared to all other options I have looked at. So I highly recommend her as a teacher! I have been having classes for 6 months now having moved to Sweden. It’s not easy to learn Swedish living here as everyone wants to practice their English. But Anneli is a sharp and very experienced teacher who understands how to help shape and build language skills. I can now hold fluent conversations and Anneli continually spots minor details in how I speak that each time help to free me up further. Having tried different official classes here in Sweden I can confirm this is the very best way to learn this language. I had 10 lessons with Anneli and my Swedish skills improved a lot since then. She´s a very friendly teacher. We had interesting conversations, she gave me a lot of material, so I could study by myself and if I had questions we would look at it during the lessons. She helped me with a Swedish presentation I had to have, this was very useful. My main focus was on my speaking skills and after a couple of lessons, people at work started to notice a difference. Anneli is inspiring, kind, fun and with good patience which is great for someone from a totally different language world(I am Chinese). She helped me to eliminate the fear of ‘open the mouth’ and increase my confidence in speaking the language which I found is extremely important for a beginner. I would have more courses with Anneli if I had time and I am seriously considering to come back after the summer. I also think Learning via Skype is a genuis idea for distance learners, with more new technologes of smart phone (facetime, Whatapp, Viber…), you can start a course any time any place! Thank you for your great help, Anneli! Anneli gave me the best start with the Swedish language that I could have hoped for; lessons over Skype that were individual to me and gave me skills that I now use every day. I have never been very good at learning languages but she always managed to find a way to capture my interest so that the information would appeal to me and stay with me. She taught me not only the basics of swedish but also bits about the culture and relevant information if I was to be travelling to Sweden. I also feel that I gained a friend as well as a teacher and would absolutely recommend her to anyone considering Swedish lessons. Anneli is no less than my fifth language teacher, and I can honestly say that she is the best. She is extremely adaptable, often adapting our lessons to my immediate needs, such as conversational material not covered in the textbook. She also teaches stockholmska with bits of culture notes and slang that make it much easier to talk to and understand my Swedish friends. If you have any Swedish needs, she is the teacher that I would recommend. Anneli has this rare gift of sharing knowledge. You cannot explain a language, you can only pass it, install it into one’s mind. That’s what Anneli does best. Therefore an hour of pleasant communication gives you more practical skills than any book could give in a week. I absolutely love the lessons and admire the teacher. Anneli is very modern and up to date with great teaching methods, she made me comfortable and confident to speak Swedish. Her classes are dynamic, always very enjoyable and she definitely makes Swedish easier to learn. Highly recommended! Anneli is an amazing teacher. My company moved me to London to take Swedish language courses for one month. In that short four weeks, my three colleagues and I were taught by Anneli. She laid the best foundation we could have hoped for and everyone we have met has been impressed by how much we learned in such a short time. Anneli presented the language in a functional and fun way that made it easier to grasp. She was sure that we learned all we needed to know to make our transition to living in Stockholm as easy as possible. Our classes were interactive, hands on, and every lesson blended well into the next one. It was a wonderful progression! Anneli gives you a wealth of first hand experience with many helpful cultural tidbits that help you to understand the Swedish language and people. The course was challenging yet fun! I am so grateful for my experience with her and have used all that she taught me already! Anneli’s patience, wisdom, and gracious spirit are the reason I have confidence in speaking Swedish and now using it in my everyday life and work in Stockholm! Very highly recommended! Anneli is the third Swedish teacher I’ve worked with and she is by far the best! She has a very structured/objective based, yet highly adaptable approach to teaching, which has been extremely effective. We work together through a great course, which I have found very useful with respect to building a good vocabulary and understanding of Swedish grammar. However, we often break off from this on focus on specific areas of language learning which may be falling behind. In my case this is generally spoken/conversational Swedish. She is super patient and has manner of delivery which I have found to be very re-assuring but also challenging when required. I’m not the most confident language learner, she takes this into account and pushes just enough without being overbearing. I’d say she is capable of teaching Swedish to any level/objective. Whether your aim is basic travel communication or fluency. Highly recommended! Friendly, patient, clear, structured, fun instruction in Swedish!! Anneli is a confident and able teacher who is friendly and fun to learn Swedish with. Anneli tailors her teaching to my needs as a beginner learning the language for the first time. The lessons progress at a speed that is comfortable for me, allowing me to cement my understanding as I progress. I like the fact that the content of the lessons is structured and has a clear focus/objective, I can see the progression I making. Furthermore, I am developing an understanding of the mechanics of the language in a context that allows me to apply what I have learned in ‘real life’ situations. I am still having lessons with Anneli and cannot recommend her teaching highly enough! Anneli is an excellent teacher! Anneli is an excellent teacher! My lessons have followed a structured and comprehensive course presented in a style that is easy to follow and understand. That coupled with additional information from the internet, Anneli’s teaching style and her great sense of humour have made my lessons highly informative and very enjoyable. Since beginning lessons my understanding of swedish has vastly improved in all areas despite having a relatively small amount of time to devote to study. When i visit family and friends in Sweden i can now be party to a conversation rather than wait for the inevitable ‘translation’. Highly recommended!! Fun, friendly and an excellent teacher!! Anneli is simply fantastic. She has a natural gift for teaching and can explain what appear to be the most complex things in memorable and easy to digest gems. She is incredibly patient (and needs to be with me! ), flexible and makes every lesson fun. In just 15 hours I have progressed from a few words (…”yes”, “no” and “beer”) to being able to converse with Swedish friends. If you are thinking about learning Swedish, then Anneli is without doubt the best choice you could make. Anneli is an excellent professional teacher in all respects; she is encouraging but appropriately challenging. She is extremely well prepared, reliable and knowledgeable, her standard of English is superb and she has a mastery of contemporary colloquial English and Swedish. Her gentle and encouraging teaching manner has enabled me to find learning Swedish much less daunting, and her sense of fun and humour has made the learning process fun. Through her help my Swedish contacts have commented on how well I now pronounce Swedish. She demonstrates a thorough understanding of my learning needs, and is able to adapt easily to whether I need encouragement with conversational Swedish, or help with more formal grammar teaching. I have found her to be a teacher of the highest standards and could not have wished more from a teacher. Quite simply, I could not recommend her highly enough. Anneli gave me phone lessons in conversational Swedish for over 18 months. She created a really relaxed environment, where speaking Swedish doesn’t feel scary at all, and is happy to discuss anything and everything! She knows all the best websites for language learners, and is very big on introducing her students to Swedish culture. If it’s Shrove Tuesday, we get an email telling us about semla; as Christmas approaches, she hear about the (slightly bizarre) Lucia celebrations. An excellent teacher. Anneli is an exceptional teacher of Swedish. She is a native speaker and really knows her formal grammar, but also has a great understanding of the idiomatic and colloquial nuances of the language. I’ve worked with her for about a year and a half off and on for an hour each week. Her lessons are well-planned and effective plus being quite creative. She not only focuses on the written form of the language, but emphasizes listening to the language, too. She also has pointed me to some great resources online including an online Swedish-English dictionary site that has been invaluable as well as a wonderful Swedish news radio site. I came to her with the goal of writing a letter in Swedish to my cousins in Sweden and through her patient and excellent help, we crafted a letter together successfully. I sent the letter last Christmas and received a reply shortly. I am pleased to say that through my lessons with Anneli, I was able to translate the letter fairly easily. So, I would highly recommend Anneli as a Swedish teacher. Great teacher, enjoyable lessons, inspiring experience! Anneli helped me get to grips with the Swedish language, with enjoyable lessons. She helped build my confidence through some of the idiosyncracies of grammar with interactive conversation sessions. Anneli’s well planned lessons meant that I could see the progress I was making :o) I feel that I have gained a good foundation in the Swedish language which I’m now ready to build on! I definitely recommend Anneli if you are looking for a superb Swedish teacher! Anneli was absolutely great as a teacher and I feel I’ve benefitted greatly and been given a good grounding in the Swedish language. Not only that, I feel my understanding of the English langauge has also improved as a result of taking these lessons. She was very patient and thorough in her teaching. This was combined with a good lesson structure and excellent material. I have no hesitation in recommending her as a Swedsish language teacher. In my experience Anneli is a natural language teacher. She is friendly enough that you feel your hesitations about speaking Swedish dissolve. She delivers the material (even boring grammar bits!) in ways that make it very easy to assimilate. We tended to approach sessions in a rather creative way, and she easily adapted to teaching me exactly what I needed to fill in the gaps in my knowledge. Having lessons with Anneli was always something I looked forward to! I’ve no hesitation in recommending Anneli to anyone wishing to learn Swedish, I’ve had a number of lessons now and they have been both fruitful and fun. Anneli is quick to make one at ease and her instruction is lucid and concise, she is a natural teacher. I’m looking forward to resuming lessons in the near future. My time spent with Anneli was both productive and enjoyable. She is a very good teacher and also a very pleasant person. Anyone wishing to learn the Swedish language will not be disappointed with her instruction. Anneli has an extremely creative style of teaching. She ensured that I enjoyed and educated myself at the same time. The language became easy to learn and I looked forward to the surprises she packed in during the session. I learnt to speak a lot in a very short time and wish to continue, knowing I have found the best teacher on the net! Very thorough and challenging, as well as being fun and enjoyable. Anneli was of great help to me, she is a really nice person who makes you feel very comfortable when learning with her. Anneli gave me a lot of confidence with her feedback, and is very precise and accurate when explaining complex gramatical concepts in the language. She has a very relaxed and positive attitude towards teaching,and one that good be beneficial to any other individual who is looking to learn or improve on the swedish language. I have been having lessons with Anneli for quite a while. Each session has been well-planned, enjoyable and useful. She is an excellent teacher and a delight to study with. Anneli is a great teacher. She has a very relaxed style and made me feel very comfortable. Her explanations were very clear and I started to understand things that books could never explain. I would recommend Anneli to anyone wishing to improve their Swedish and I hope one day to continue studying with her.